Up on time and had a coffee and croissant on Brighton beach. Overcast this morning with a hazy sun, which suits me perfectly after catching the sun yesterday. Riding east against a slight headwind along the coast over gentle hills we pass Roedean school and Newhaven before reaching Seaford and the Seven Sisters. Seaford sea front: Is it possible for this man to pose for a picture without impersonating Eric Morecambe? We'd been warned about the hills behind Beachy Head as being 'immense and relentless'. The route planner showed that they reached 500 feet from sea-level, but not much detail beyond that. Expecting three lots of hills like this today, so forewarned, etc. The first was a very sharp hill, made harder by dropping back down to sea level and then starting all over again. If it hadn't done that, I'd been planning to ride the mile down to the beach to capture the iconic shot of the Seven Sisters, but needs must when you have many miles ahead. As we near the second summit it's Gary's turn, of course, for a mechanical mishap as his front gear cable snaps, leaving him stuck in his lowest gears and facing another 60 miles like that. So yet again we need to find a bike shop, but this time on a sleepy Sunday. No luck in Eastbourne, which seems to be almost entirely closed - if not close to death - so aim for Hastings for lunch and repairs. 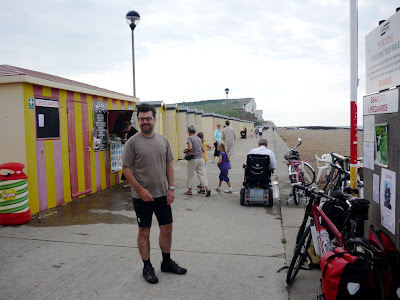 After passing through Bexhill - sadly no time to visit the De La Warr Pavilion - we find a retail park with a Halfords who can fix the bike while we get lunch from Tesco. But I'm worried that, as usual with my optimistic schedule, we'll have to race to get to Dover and can't afford any more hold ups.